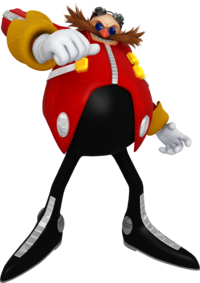 Dr. Ivo Robotnik, better known as Dr. Eggman, is the primary antagonist in the Sonic the Hedgehog series and the arch nemesis of Sonic the Hedgehog, much in the same manner as Bowser's conflict with Mario. He is a genius with an IQ of 300, and his goal is to dominate the world and build the Eggman Empire. Dr. Eggman also appears in the Mario & Sonic series as a playable character. He is voiced by Mike Pollock, who has voiced the character in the game series since Shadow the Hedgehog. Dr. Eggman, as well as several other Sonic the Hedgehog series characters, appear in the Olympic crossover game Mario & Sonic at the Olympic Games. He is a Skill player, despite his rather large size, and he's also unusually fast. However, Dr. Eggman is lacking in power, and his stamina is weak. Eggman appears as a playable character in the sequel Mario & Sonic at the Olympic Winter Games, and appeared in the first trailer for the game along with Sonic the Hedgehog, Mario, and Wario. He is again a skill type character. In the DS version of the game, he is one of two main antagonists of Adventure Tour along with Bowser. He and Bowser try to stop the 2010 Olympic Winter Games by capturing all the Snow Spirits. They would like to make their own Olympic Games, but Mario, Sonic, and their friends stopped Eggman and Bowser. Dr. Eggman appears once again as a Skill type playable character in Mario & Sonic at the London 2012 Olympic Games. He has a very high Technique level and performs well at events such as Gymnastics. In the 3DS version, he is one of the Tricksters. In story mode, he along with Bowser fog London to prevent the Olympic Games from happening as revenge for not being invited. Dr. Eggman also appears in Mario & Sonic at the Sochi 2014 Olympic Winter Games. He retains his role from previous titles, being a playable Skill type character. Dr. Eggman returns yet again in Mario & Sonic at the Rio 2016 Olympic Games. In the Nintendo 3DS version, he is exclusive to 110m Hurdles and Equestrian. Dr. Eggman makes a cameo appearance as a collectible trophy in Super Smash Bros. Brawl, which is obtained by collecting over 500 stickers. He also appears as a sticker which increases a character's launch resistance by 39 points. Dr. Eggman makes a cameo appearance as a trophy in Super Smash Bros. for Nintendo 3DS / Wii U.
Dr. Eggman appears as a Spirit in Super Smash Bros. Ultimate. Although the devious Dr. Eggman has great Skill-based abilities, he also is quite powerful. His huge, lumbering frame doesn't give the impression that he would be good at gymnastics, but believe it or not, he can handle the trampoline and vault quite well. SONIC THE HEDGEHOG (1991) A self-proclaimed scientific genius. Dr. Eggman sports an IQ of 300 and wants to conquer the world and build his evil empire of Eggmanland. An expert in his field, Dr. Eggman places robotics over all else in life--a reflection of his selfish personality. He doesn't know when to quit and always comes back for more no matter how many times he is defeated by Sonic. Dr. Eggman's official profiles and statistics for the game. Wii U Sonic Lost World (10/2013) Dr. Eggman knows a great deal about robots, which is neat. He also knows how to turn animals INTO robots, which isn't so neat. You'd think a man with an IQ of 300 would stop going up against Sonic, but he keeps on trying, all to build a world around his Eggman Empire. Here is a man who immortalises animals in mechanical form because he just loves them so much! Wait. That's not quite right... Instead of using his talents for peaceful ventures, Dr. Eggman, a scientist with an IQ of 300, nurtures plans for Eggmanland to reach all four corners of the world. First poaching animals, now this? Terrible. For this subject's image gallery, see Gallery:Dr. Eggman. His name in the Latin American version of Sonic X; Huevo is the Spanish word for "egg". Taken from the SatAM continuity. Dr. Eggman appears alongside Bowser and Zangief in the Disney film Wreck-It Ralph. Dr. Eggman's second Japanese voice actor Chikao Otsuka also voiced Wario in the Japanese commercials for Wario Land games. Although his profile in Mario & Sonic at the Olympic Games states he is quite powerful, Power is one of his lowest stats in the game. This page was last edited on April 21, 2019, at 21:34.